Wonder who owns this little beauty now? 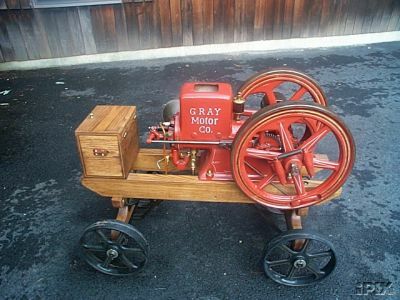 I am listing a Gray model "J" 1 1/2 h.p. hit and miss engine. It has spark plug ignition and was manufactured about 1914.
wheels for easy transport. I used a 6 volt battery with a buzz coil to fire the spark plug ignition. crank bearing journals. They used felt wadding lubricated with oil as is found in this engine. doesn't have the raised lettering on the water hopper as some models have. a corn cracker or sheller at an engine show.